The photo below shows Dave Russell brazing up a special four wheel racing "bike". It is believed he made a total of three of these machines. They were built, as you can surmise, for a very special purpose, three wheels had to be in contact with track at all times. Design required that one wheel had to be offset. Dave was always willing to take on these orders. This narrative was developed from conversations between Dave Russell and Stewart Paton. Dave Russell was born in Fulham, however his family moved to Slough when he was a youngster. Dave attended Slough Grammar School until 1950. Then Dave went on to serve a five year apprenticeship with OMT, a local engineering company. Upon completion of his apprenticeship he went on to serve out his two year National Service in the Royal Air Force. Dave then worked at a few engineering companies but could not settle down. During the fifties cycling was booming. Bikes were the pre-eminent mode of transport, recreation, exercise and sport for everyone. It was natural for Dave to settle down and work with Ron Kitching. After several years with Ron Kitching Dave moved on to Hobbs of Barbican. Some time later an opportunity opened up to rent premises in Slough close to the town center. Dave now could open his own shop to repair, build and sell bikes. Dave's business expanded and it was not long before had to find larger premises. Dave rented and then purchased a shop in Chalvey Road in Slough. This became Dave's shop for many years. Eventually, upon Dave reaching retirement age he decided to slow down and moved to smaller premises in Twyford, near Reading. It was from these premises that Dave did finally retire. Dave Russell bike were built bikes only to order. Dave was certified to use Reynolds 531, 653 and 753 and Dave was particularly proud of the 753 certification because of the intensive testing required. Dave incorporated Nervex and Prugnat lugs into his bikes. In later years Dave incorporated Ishiwata and Columbus tubing into his bikes. Dave's building career stretched over 30 years and amounted to over 3000 frames including tandems. Dave lost count of the wrecked frames he resurrected and making, so called, 'bargain bikes' ridable. Dave Russell had a reputation for being open with his customers. He would explain in clear terms the work that was required. He would equally use his skills on a custom bike as well as in the repair of a boy's cherished wheels. 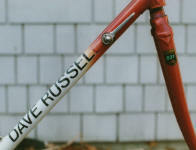 Dave Russell bikes are designed and built in the best tradition of the Classical British configuration and Dave's shop was always a one man operation. Dave expressed his high regard for the frame builders he worked with but had a special regard for Harry Quinn and the quality of his work. During his career Dave Russell always gave his support to local riding clubs and individual riders. In the early days Dave rode for Maidenhead Road Club and was an active member of the Chiltern Road Club. Dave also often gave his support to many individuals just so that he could see his frames coming in well placed. In the seventies racing in West London was in its heyday. Steve Heffernan and Ian Bradbury were both National Pursuit Champions. Roger Queen of the Velo Club Slough was National 50 mile TT champion and was in the top three in the National 25 TT on several occasions. It was these successes on Dave's machines that caused several top dealers to use Dave's frames on their own branded frame sets including Reg Barnett of South London. 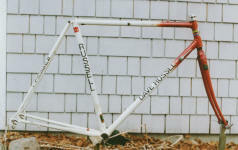 "Early 1980s Dave Russell road bike. Dave mainly built custom bikes. I bought it from a friend of mine who had Dave build it for him when he was doing a lot of business travel to the Slough area of London, where Dave had his shop. I got it brand new, unbuilt-up, for when he got back to the States, he discovered Dave had gotten the dimensions wrong � it didn�t fit him. But it fit me, and I gladly took it." "It�s made of 531c. My friend wanted him to use Columbus tubing, but Russell told him 'we have perfectly good tubing here in England' and refused to use Columbus." "...(snip) ...note the fastback seatstay arrangement with integrated seatpost bolt. I�m told that was something of a signature of Dave�s."